Short answer: Keys and keyways prevent the shaft from rotating on the bore and can assist in torque transmission between the two connected shafts. Sometimes understanding the small details, help us understand the big picture. On this blog we will dive into some basic concepts of power transmission. Have you tried to start an engine, or put a drive train into gear, and nothing happened? You may have even heard the starter motor engage and start, but then there was no forward motion when the transmission finally became engaged. Most of the time, when this occurs, there are a few things that you can check, such as the transmission fluid, transmission shift cable, or the transmission shaft key. But, let me explain this a bit further. As the term easily implies, power transmission is the transfer of energy from a place of generation to a place where it is applied to perform useful work. In Figure 1 below, you can see how a steam turbine transfers the power generated by steam into a generator, which in turn creates electricity. Note the shaft connecting the steam turbine with the generator. Power generation is one of the many industries covered by Lovejoy products. A shaft is an element used to transmit both the power and torque. Shafts are made in a variety of different shapes and forms, but most tend to have circular cross sections that are either solid or tubular shaped. Shafts transmit power directly from a driving device or power source into a load (figure 1). Shafts can carry gears, pulleys, and sprockets in order to transmit rotary motion and power via mating gears, belts, and chains. Alternatively, a shaft may simply connect to another shaft via a coupling mechanism. Couplings are connected to a shaft by means of a key, keyway, or keyseat. A key is a piece of metal used to connect a rotating machine element to the shaft. A key prevents a relative rotation between the two parts, and may enable torque transmission to occur. For a key to function properly, both the shaft and rotating elements (gear, pulley and coupling) must have a keyway and a keyseat. 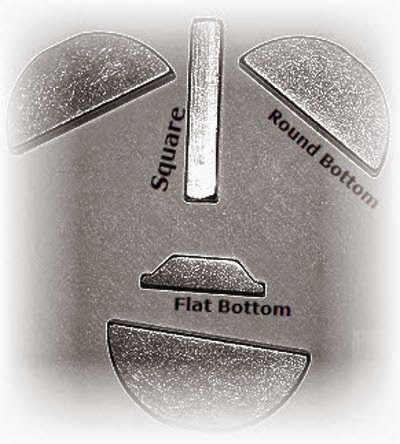 Usually the term keyseat is referred as a groove or pocket on a shaft, and a keyway is a slot in a hub in which the key fits into. The complete system is called a keyed joint (Figure 2). See how keyways and keyseats are made here. 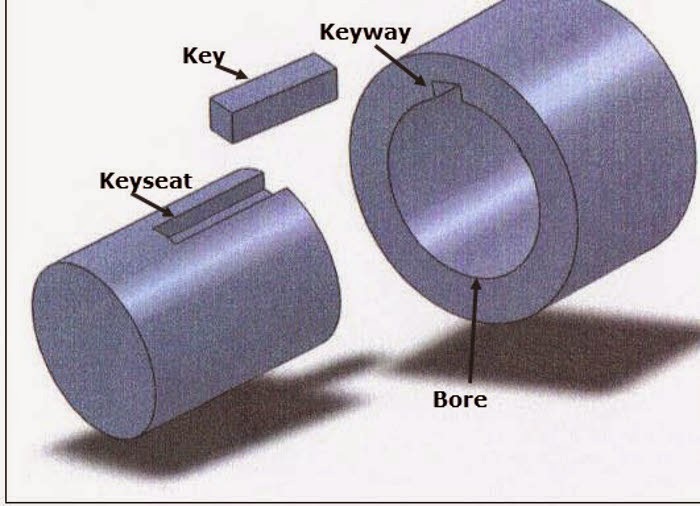 In order to lock a hub or bushing and shaft together, and also to prevent a shaft from rotating in the bore (Figure 2), a key is commonly inserted into a keyway that is machined in both the bore and the shaft. The key is responsible for preventing any rotation between the shaft and the bore, and also carries a portion of the torque load to the keys. Torque transmission by keys is the most common and widely used power transmitting method. Unfortunately, misaligned keys and keyways can result in mechanical failures. Therefore, in order to ensure an appropriate fit, the width and height dimensions of a standard key and keyway must adhere to recommended tolerances. Industry standards for key sizes in various bores exist for both the English and Metric systems. In addition, when there is a distance that exists between the driving and driven components, drive shafts frequently connect with one another using one or more universal joints, jaw couplings, or in some cases, a splinted joint or prismatic joint.